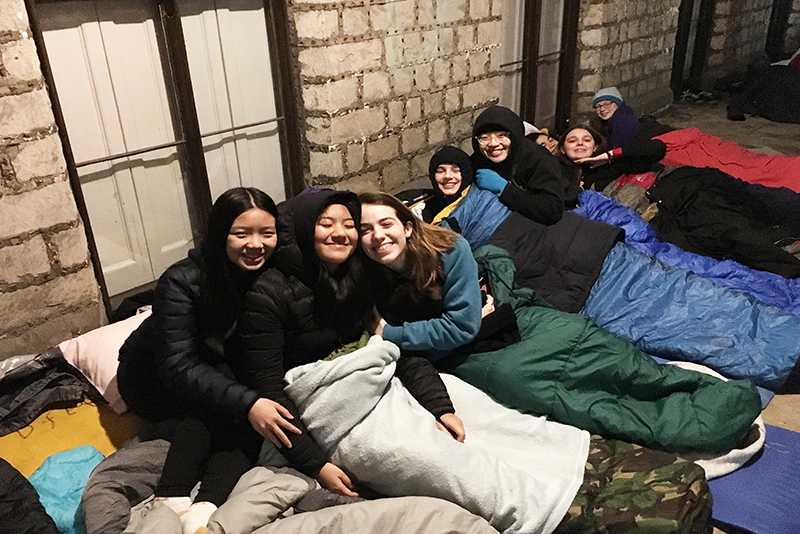 We held our first Sponsored Sleep Out at Wycombe Abbey on 23 March. Mika and Fleur, our outgoing Charity Prefects, worked really hard to put this fundraising event right at the very heart of Wycombe Abbey and I do believe that they are leaving us with quite a legacy for future years. The evening began in Chapel with a talk from Wycombe Abbey Senior, Sam Martin, from Wycombe Homeless Connection. At 9pm 24 Sixth Form girls, along with seven members of staff, gathered in the rain with warm clothes and sleeping bags. After some delicious hot chocolate and cookies, we bedded down for the night outside the staff room and Chapel. There was always the backup plan of going inside the Chapel if the weather became too much of a challenge. Ultimately, this backup plan was not needed and I am unbelievably proud of all the girls and staff who took part. No one moaned about the cold, even when it reached four degrees at 4am, and all of the participants stuck it out and slept outside. An amazing £2500 was raised for Wycombe Homeless Connection and those of us who took part were able to reflect on how truly blessed we are.